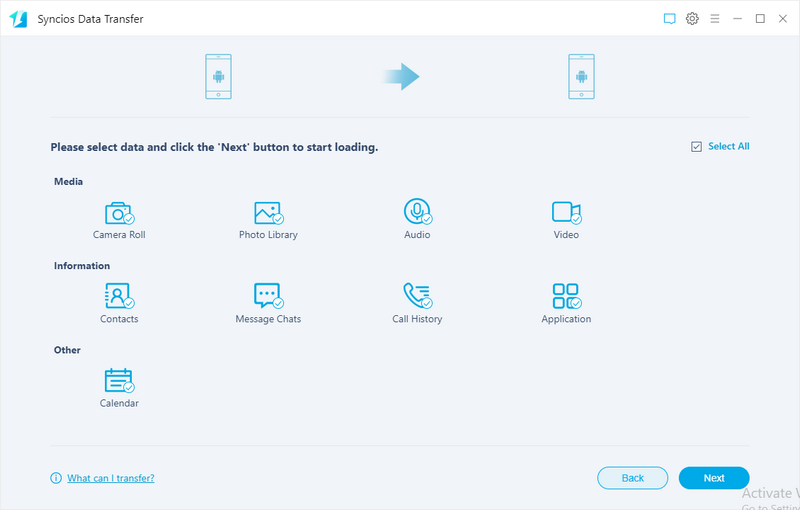 Step 1: Download and install free Syncios Mobile Manager on your computer, connect your Redmi Note 4 to computer. Syncios will install USB drivers for Redmi Note 4 on computer automatically. Please enable the USB debugging mode on your Xiaomi device. PS:Any detection problem, you can visit How to Fix the Android Device Detection Problem for help. Step 2: After your Redmi Note 4 is detected, click Media button, all of songs and tag information will be listed. You can delete, export, import or add songs to Redmi Note 4 easily. Step 3: Click Add button, and there will be two options - Add files and Add folder. Under "Add files", you can choose multiple audio files to import at one time by holding Ctrl/Shift key. 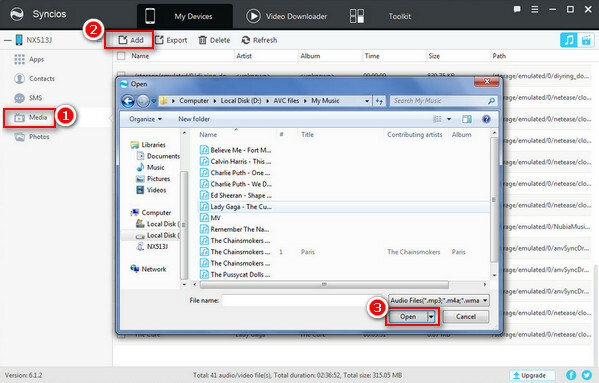 Select the music files you want transfer and click Open. And there will be a green bar shows "Add music files...". Wait for a while, and all the songs will be transferred into your Redmi Note 4. If you switch from old iPhone or other Android phones to Redmi Note 4, and you want to transfer music from these old phones or other devices like iPad, iPod touch to your new Redmi phone, Syncios Data Transfer is a great tool to help you do this in one-click. What is more, other contents including contacts, messages, call logs, photos, videos, apps, notes, ebooks and more also can be managed easily. 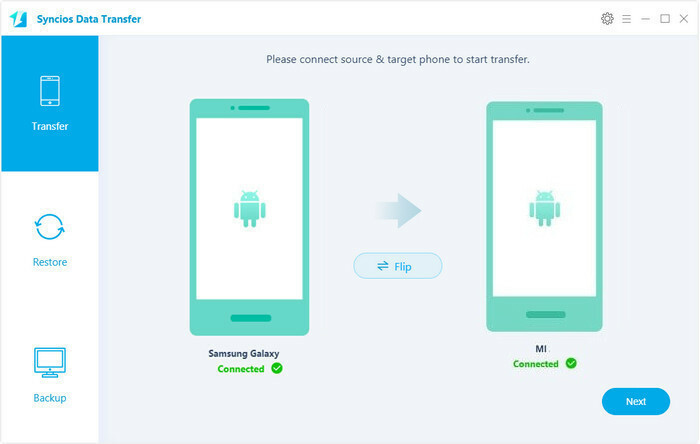 Step 1: Connect your old phones or devices and Redmi Note 4 to your computer and launch Syncios Data Transfer. 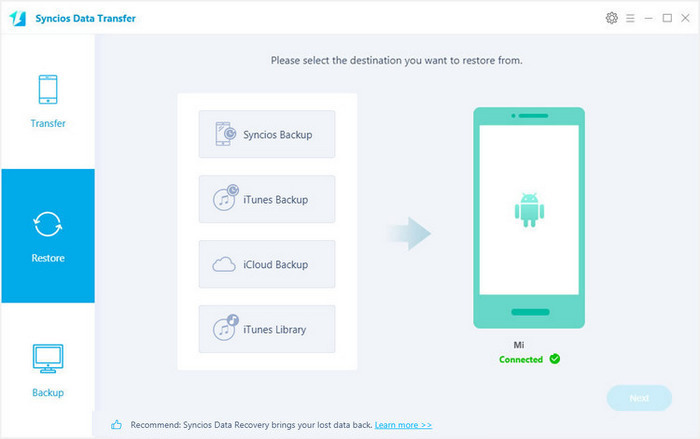 Click the Start button under Phone to Phone Transfer, then the backup list will be displayed. Step 2: The program will recognize these 2 devices in a few seconds, and please make sure that Redmi Note 4 is the target devices. If not, please click Flip to exchange. This handy mobile transfer also enables you to restore your music collection or music playlist from iTunes library to your Xiaomi Redmi Note 4. Step 1: After connecting Redmi Note 4 to computer and launching Syncios Data Transfer, click Restore Phone from iTunes from these 4 modules and click library button. Step 2: Click Next button after selecting the music you want to transfer to Redmi Note 4.